I still have a little trouble with the idea of North Korea successfully invading the U.S., but I'm willing to concede that if it happened, the result probably wouldn't be pretty. 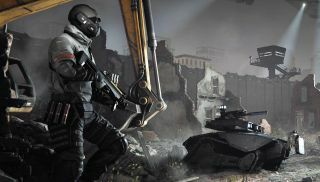 Such is the case in this ten minute Homefront: The Revolution gameplay video , which depicts a small slice of life in an ugly, broken world, where the resistance must move fast, strike hard, and fight dirty against an overwhelming KPA presence. The action in this video comes off as a bit contrived, but the message is clear: Guerrilla warfare is the order of the day. Get in, do your thing and then haul out before anyone who can really drop the hammer shows up. It's a dirty kind of war, and it's also one that's tough to simulate in a videogame. After all, setting bombs and running away isn't a whole lot of fun, nor does it lend itself particularly well to a heroic narrative, and sooner or later players are going to want to be doing something a little more assertive. I think that's where the original Homefront really lost me. There were a lot of issues, but for me, its biggest stumble was simply a failure to make me feel like an outgunned revolutionary on the run. I wiped out countless Korean soldiers in stand-up fights, and even had my own pet tank for those times when I absolutely, positively had to blast dozens of guys into paste. The gameplay here looks solid but not particularly innovative, and despite the narrator's claim that Crytek is trying to avoid making the lead character a "super-soldier taking on the world," it seems to me that's exactly what's happening. My hope is that Homefront: The Revolution will do a better job of recreating that "barely hanging on" feeling of fighting in a resistance movement than its predecessor, but I can't say I'm overly optimistic about the likelihood of it happening.